Busy Hands Quilts: Join Me For a Gravity Quilt Along!! Join Me For a Gravity Quilt Along!! I have super exciting news to share with you all today! 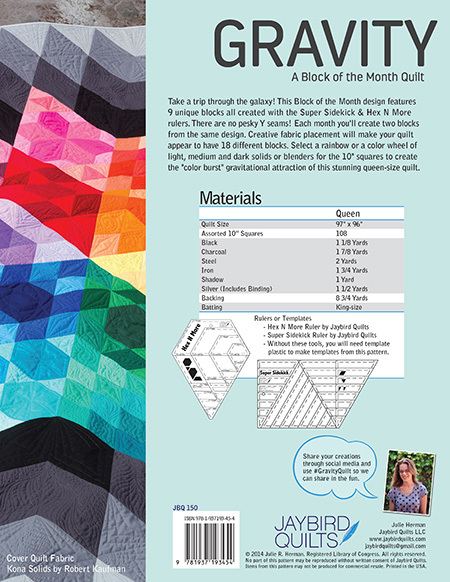 I am hosting a Quilt Along for GRAVITY, a gorgeous quilt by Julie of Jaybird Quilts! When I couldn't find an online GRAVITY Quilt Along to join, I contacted Jaybird Quilts and received permission to host a Quilt Along here at Busy Hands Quilts!! This Quilt Along is still in the planning stages, and I'm working out the schedule and prizes. Yes, prizes! I'm planning on monthly progress link-ups and prizes, including a Grand Prize drawing for those who complete their quilt! If you own a quilt shop or are a pattern designer and would like to sponsor a prize, please contact me ASAP! HERE is a guest post by one of the pattern testers who made the GRAVITY quilt in printed fabrics with a white background! 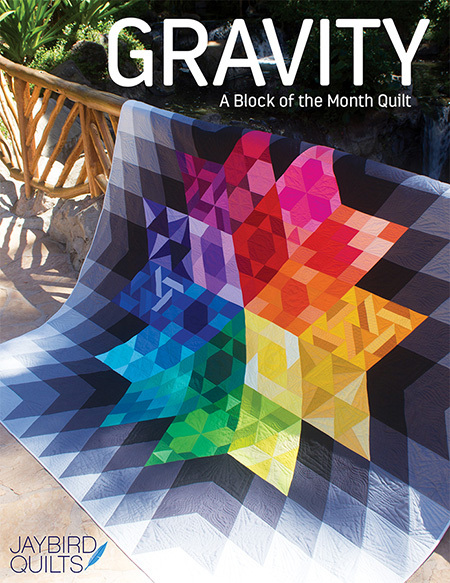 It will be fabulous to see this quilt from another perspective, and you might decide you need to make a GRAVITY quilt in different fabrics if a RAINBOW isn't for you! 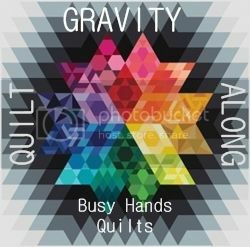 Follow Busy Hands Quilts so you don't miss what our guest blogger has to say about the GRAVITY pattern! I will share my sewing progress with lots of pictures. You know how much I love pictures, big pictures, colorful pictures, tons of pictures! I'll also share helpful tips and tutorials by Jaybird Quilts. Jaybird Quilts recommends the Hex N More and Super Sidekick rulers for easier cutting. Be sure you get the Hex N More, not the Mini Hex N More; and get the Super Sidekick, not the Sidekick. Template patterns are included in the book if you'd like to make your own - you'll be making 12 of them! The Hex N More and Super Sidekick sound much simpler to me! SALE ON KITS, BACKING AND TEMPLATES! Save 20% off your GRAVITY Kit, Backing Set, Hex N More, and Super Sidekick rulers this week at Fat Quarter Shop with code CREATE20. This sale includes most items in their shop. This sale ends this Friday, March 13th. Below are the fabric requirements for the pattern if you decide not to purchase the kit and plan to create your own version. Click on the picture to enlarge it. Congrats Myra!!! I knew you could do it...ai would love to do this with you, but don't want to buy all of these things right now while I have so much in the go. but I will be following the progress and putting up your button..have fun!!!! Oh yes - I will definitely join you and try and get a post up on my blog pointing people in your direction! What a fun quilt - and a fun quilt-along! If time permits, I might get to join this one. :) Thanks for linking up to MCM! I can tell that you are very excited! It looks like a rather fun pattern! What a strange coincidence...I am visiting you via a series of links. First Jo's Country Junction, then Judy Laquidara. Last night I bought the Gravity quilt kit. I have signed up to follow you through BlogLovin'. I'm in! I ordered the book, and I have one of the rulers. I'd like to join, but I'm a little over-extended right now. I may just watch and get inspired. Yeah!! I just purchased the kit from FQS. I'm looking forward to this. Sounds like an exciting project I will have to look at getting the pattern and material and if I will be able to get it in time for the start. Ok, you tempted me enough, I jumped on to Fat Quarter Shop late last night and ordered the kit (along with a bunch of other stuff *blush*). Can't wait to get started! !